Each IMSchools classroom is designed to give children the beauty, order, and independence needed to discover their own joy in learning. While all six locations offer very similar Montessori environment each school has its own character and atmosphere: from our garden themed classrooms at Paoli campus, home–like atmosphere at Malvern, to our historic building at the West Chester campus. Each school provides comforting, supportive and joyful learning environment with a great emphasis on fostering children’s connection to the natural world. International Montessori Schools welcomes children ages 6 weeks through 4th grade. Each campus offers a Pre-Primary (18 months – 3 years) and Primary Program (3–6 years.) Currently, the Elementary Program (grades 1-4) is available exclusively at our Paoli campus, while Infant Program (6 weeks-18months) is available at Malvern, Great Valley and Wilmington campuses. 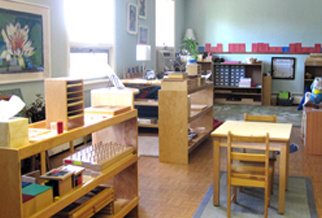 Practical Life – The Practical Life area is essential for a strong Montessori educational foundation. In this area a child is developing and strengthening control of movement (fine motor skills), concentration span, self-confidence, and a love of learning. The activities in Practical Life are made up of familiar objects that a child would observe in everyday life. The activities are designed and chosen so that the children feel comfortable and will be able to master the activity. These activities can be grouped under: care of self, control of movement, care of the environment, and grace and courtesy. The overall goal of this area is not only to help children gain self-confidence in their working abilities, but to expose the children to fundamental activities that will build their concentration span and work with activities they will encounter through adulthood. Practical life skills are of great interest to young children and form the basis of later abstract learning. Sensorial– The Sensorial area of the classroom helps children become more aware of smaller details that are often overlooked and . Each sensorial activity focuses on one important quality such as color, weight, shape, size, texture, sound or smell. Sensorial activities develop the senses of perception and discrimination for exploring and noticing small differences in patterns as well as fine motor function development in the hands. The sensorial area builds the child’s concentration for a wider awakening of the senses and perception for distinguishing different qualities and patterns. These activities develop and refine the 5 senses—seeing, hearing, touching, tasting, and smelling—and build a foundation for speech, writing, and math through the use of sensorial materials. Language– The Language area of the Montessori classroom encourages development of early-literacy skills through the use of phonetic sounds. In the Language area children are exposed to various types of phonetic awareness activities to build a strong literary foundation. Montessori Language activities are designed to improve a child’s vocabulary, listening skills for common sounds, and differentiating between objects and pictures. Language activities include learning the shapes and sounds of letters, practicing fine motor skills by writing, vocabulary development, matching words and pictures, reading development with word lists, practicing parts of grammar (nouns, verbs, adjectives, etc. ), creating sentences and reading silently. Math – The Math area of the Montessori classroom encompasses the use of concrete materials for the recognition of numbers and the recognition of quantity as well. Through these activities, children learn exactly how much a symbolic number stands for (i.e. the number 5 means counting the correct number of objects to make the number 5). Mathematics activities are divided into six categories that include: counting and the decimal system, memory work, concrete abstraction, arithmetic tables and geometry. Children are introduced to more complex mathematical procedures and concepts as they are individually ready. Often times a child will complete a mathematical activity a few times until he feels ready to attempt a concept that is more difficult. Culture area of the classroom encompasses a variety of subjects that are supplementary to the Montessori method. Cultural subjects include: Geography, Zoology, Botany, Science, Art & Music and Spanish and Mandarin Languages. Studying these subjects provide children an opportunity to explore their curiosity of different and worldly ideas. Studying Geography allows the children the opportunity to understand their own culture as well as many others. The children can relate and understand cultural diversity and ultimately come to appreciate differences between humankind. Science in the Montessori classroom allows the children to observe and work with hands-on experiments that will cultivate a lifelong interest in nature and discovering more about our unique world. Through the study of Botany, the children learn about plants (what they look like, how to take care of them, how they grow, etc.) so that they may appreciate nature in a more organic way. The study of Zoology shows children animals from all around the world (where they live, their unique Eco-systems, what they eat, how they grow, etc.) Lastly, the study of art & music allows the children a very unique opportunity to express themselves. Children have an expressive and uninhibited experience of moving, dancing and singing among their school peers. Art & Music allows children to gain a literary understanding of language and develop their cognitive, social and emotional skills in a constructive way.